Thank you very much for subscribing to SCUBA News. This month a story about how a small reef fish disguises itself, infiltrates damselfish communities and once accepted kills their young. Plus, readers are looking for dive buddies and advice in Jeddah and Crete. Diving insurance with no depth limits! Add to existing travel insurance policies. Designed especially for divers. Underwater photos taken by Tim Nicholson on Lady Elliot island, the Yongala, Lady Bowen and Agincourt Reef. Showcased on our Google Plus Community. I'm going to be in Crete in early June - anyone any experience? I'd like to do one day of diving - and will organise my own accom. Where and with whom? Any suggestions for Sly or Annabel, e-mail news@scubatravel.co.uk. 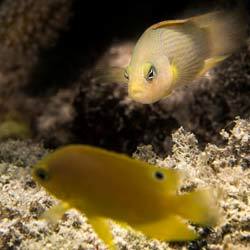 A new study by researchers at the University of Cambridge has shown that the dottyback, a small predatory reef fish, can change the colour of its body to imitate a variety of other reef fish species, allowing the dottyback to sneak up undetected and eat their young. Its Latin name, Pseudochromis, means false damselfish - giving clue to its mimicry abilities. While using mimicry to hunt or hide from other species is commonplace in nature - from cuckoos to cuttlefish - scientists point out that if the same physical deception is encountered too frequently, species on the receiving end become more vigilant and develop tactics to mitigate the mimics. "This is the first time that an animal has been found to be able to morph between different guises in order to deceive different species, making the dottyback a pretty crafty little fish" says Dr William Feeney, co-author of the study from the University of Cambridge's Department of Zoology. Activists are taking legal action to try and stop mining on the tiny Indonesian island of Bangka, a hotspot of marine biodiversity in the Coral Triangle. It has long been known that whales were seriously endangered during the 20th century, but new research shows just how close we came to wiping them out completely. Sunburn can ruin a scuba diving holiday, but you could soon know when to cover up thanks to an early warning sunburn indicator bracelet, developed by Queen's University Belfast. The number of US fish stocks listed as overfished or subject to overfishing has dropped to an all-time low. Tens of thousands of endangered turtles die every year in the United States when they are inadvertently snared in shrimp nets, an environmental group alleges, filing a lawsuit Wednesday against the government. What's next in the fight against illegal fishing? The political and industry support is already there, but what systems are being put in place to make sure countries can be more effective against illegal fishing in the future? Stretching 1,400 miles along the Australian coast and visible from space, the Great Barrier Reef is home to three thousand individual reefs, more than nine hundred islands and thousands of marine species, and has alternately been viewed as a deadly maze, an economic bounty, a scientific frontier and a precarious World Heritage site. New book out May. Outside of humans, the most complex alliances known are found in a population of bottlenose dolphins in Shark Bay, Western Australia. Surprising new short-circuit to the biological pump: dying phytoplankton release chemicals with a steroid-like effect on marine bacteria.